Start planning your next PBL project with confidence, using this step-by-step form as your guide. Why is a project planner important? When you’re ready to design a project for your classroom, it’s helpful to have a framework to capture your ideas and organize your plans. A Gold Standard PBL unit has a lot of pieces: the driving question, your goals for student learning, the major product students will create, the entry event, the resources you’ll need, and more. It’s also a good idea for a school to use a common framework for PBL unit planning, so teachers can collaborate using the same language, and share projects more easily with colleagues. So we’ve created a Project Planner to support you in the planning process. It has two key parts. 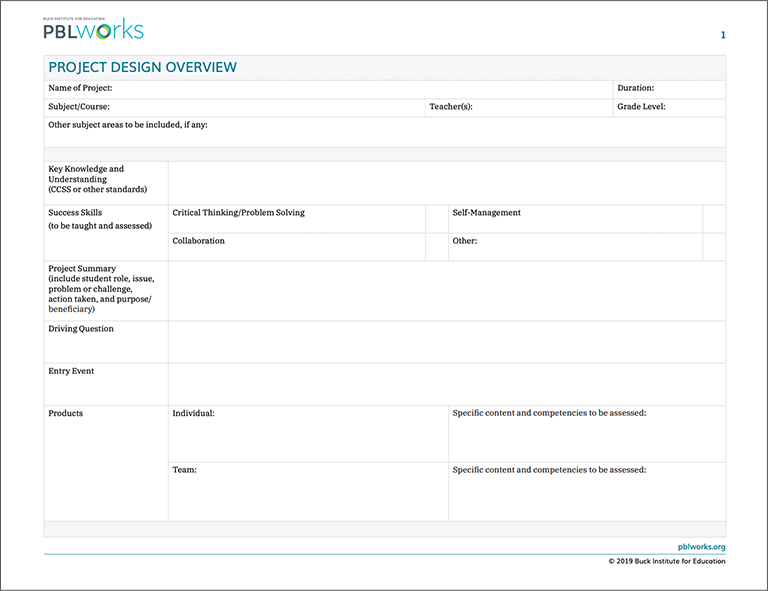 The Project Overview is where you can record the key features of your project. The Student Learning Guide is where you can record your project’s learning targets, checkpoints and formative assessments, and instructional strategies you will use to meet the needs of all learners.